Last week, a deadly earthquake shook the mountains of southern Pakistan, leveling buildings and claiming the lives of over 400 people. 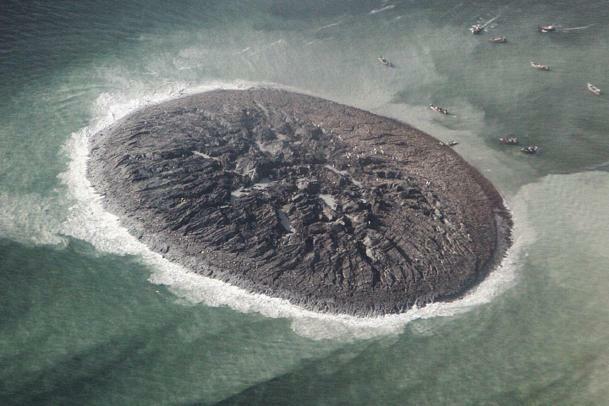 In the aftermath, though, people living along the country's coastline reported that a new island had sprung up from the water, and scientists believe that it may have been caused by a mud volcano. The new island, measuring around 90 metres wide and reaching about 20 metres above the water line, formed a little over 2 kilometres from the shoreline. Initial reports of the new land-mass were met with some skepticism, however NASA's Observing-1 satellite captured images of it on September 26th, and comparing them to Landsat-8 satellite imagery from April 17th clearly shows that it is definitely something new. The ideas for what caused this island to form vary, but the one that has gained the most support so far, it seems, is that it was a mud volcano — the earth of the ocean floor was loosened by the earthquake, which allowed a trapped deposit of methane gas to push up to the surface, carrying the mud and earth with it. These mud volcanoes are fairly common in Pakistan, with 80 active ones currently known to be in Balochistan province, where the earthquake occurred. This island hasn't been named yet, but it's likely not going to be around long enough to earn one. These mud volcano islands aren't very stable, and this one will be eroded away by the ocean tides within a few years at the most.